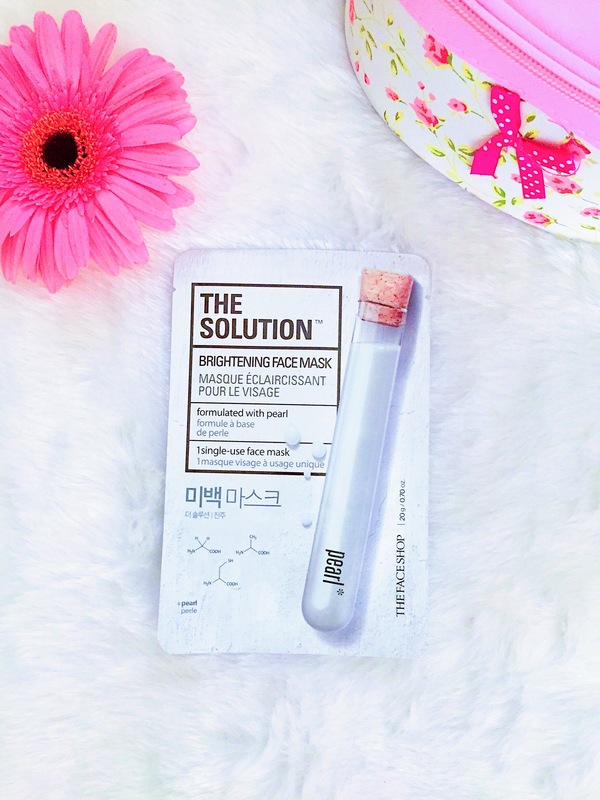 Review: The Face Shop- The Solution Brightening Face Mask. Today’s review is going to be in The Face Shop the Solution Brightening Face Mask. It is an exquisite mask to make a dull skin bright and fresh. Product Description on the cover of the MASK says: This face mask features a light as air sheet that feels soft and weightless on skin. The serum containing Pearl powder provides a brightening solution to the dull skin. Price: Rs.150/- for each sheet. The Face Shop mask has a silver glossy plastic film inside the packaging. As stated it is a very lightweight semi-transparent white mask, it feels super light on the skin. The film helps to embrace this fine mask easily without any clutter and moisturizing slippery gel slithers smoothly onto the skin. When I applied the sheet it fits nicely and gets easily stick on my face that I can move or walk easily with it. Also, it is easy to peel off from the face. As it claims in point of fact it does help to remove the dull texture on the skin and makes it healthy glowing. Mask makes skin smooth, it also says that it tightens up the skin I can’t pass a remark on it probably it will after applying more than 1 sheet. But yes, It acts as an instant skin brightening mask that looks flawless. Also, it nicely reduces baby fine lines and rejuvenates my skin. But it can’t work against dryness or patchiness. Dry skin needs an instant moisturizer after using this. On the package, it claims that it doesn’t have any paraben but it has alcohol which is definitely not good for skin, especially for sensitive skin. Still, it never broke me out. Remove sheet from package and remove film on one side of the sheet. Apply evenly and firmly to face. Remove sheet after 10 to 20 minutes and gently pat to promote absorption of the remaining essence. Final Verdict: Would I Repurchase/Recommend The Face Shop the Solution Brightening Face Mask? Yes, this one perfectly suits my sensitive and combination skin. I will definitely pick more as an instant use mask. PS: I chose 3 Masks as per the requirement of my skin other two are The Solution Smoothing Face Mask and Pore Care face mask, I will publish an article on other two soon.